In many cases, electrical isolation is required to ensure reliable operation of the sensors. Some sensors, such as pH sensors and conductivity sensors,they will interfere with each other and do not measure properly in the same container when they connect to the same power .To ensure stable and reliable operation of the sensors with no interference,it is necessary to isolate the signal and the power. Gravity: Analog Signal Isolator is efficient in preventing the electrical interference between sensors. 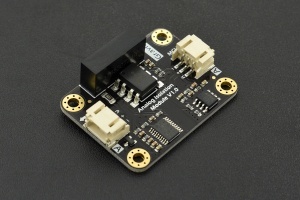 This module has an onboard 5V isolation power which could directly supply to the sensor. Therefore, you do not need to prepare the external power, such an easy and practical! The connector of wires are special designed for DFRobot 3Pin analog sensor, plug and play, no need for soldering. The analog signal transmission ratio is 1:1, which contributes to a very small impact on output signals of sensors when this module connect into the circuit. Futher more, you do not need to change the code of the mainboard. This anlaog signal isolator is applicable to prevent interferences between sensors, such as multi-parameter water quality monitoring system that need to prevent interferences between water sensors. 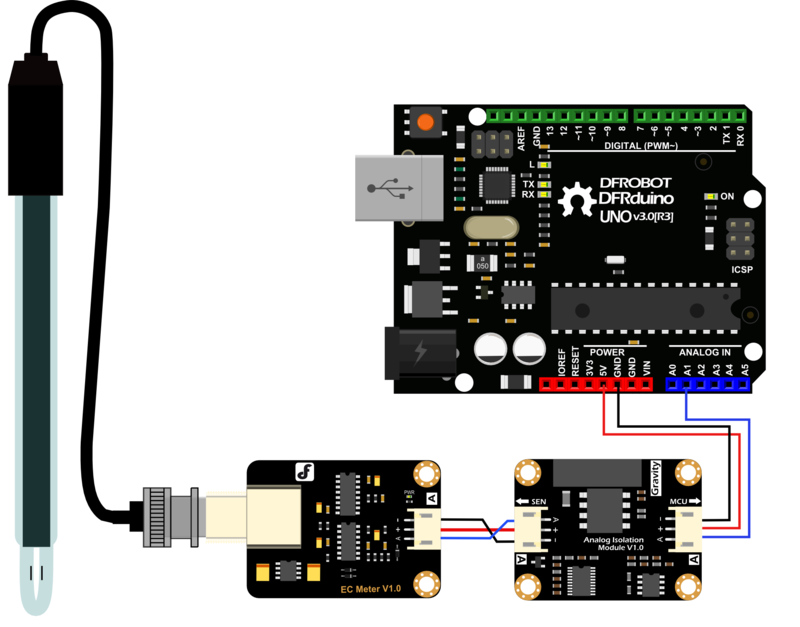 This product is almost compatible with all analog sensors produced by DFRobot. It could satisfy varied demands in situations which require electrical isolation. 1.The MCU terminal (non-isolation terminal) should be provided with precise voltage of 5.0±0.1V. The higher the precision of input voltage, the higher the precision of analog output signal. 2.This module consumes relatively large current during operation, so you'd better to provide external power supply to Arduino board to guarantee enough power and voltage precision. 3.Please pay attention to the operating current of your sensor or module, the maximum output current from SEN terminal is 170mA. 4.The GND of the MCU terminal(non-isolation terminal) and the GND of SEN terminal (isolation terminal) are isolated from each other. Do not short circuit them. 5.It is normal for the isolator generates heat while working. As shown in the figure below, this analog signal isolator has two connectors, one is on the left and another is on the right. The left connector named SEN should be connected to the sensor or module.The right connector named MCU should be connected to the main control board. This tutorial will use a conductivity sensor as an example to demonstrate how to connect this analog singal isolator in the circuit,to electrically isolate the sensor. The conductivity sensor releases high-frequency electrical signals into the water. Therefore, if there are other water quality sensors in the same container, such as pH sensors, they will be seriously disturbed. Therefore, it is necessary to electrically isolate the conductivity sensor. As shown in the figure below, connect the sensor to the SEN terminal of the isolation module (use a dual-head PH2.0 cable, this cable is included with the product). Then connect the MCU terminal of the isolation module to the Arduino board. After the steps above, the electrical isolation of the conductivity sensor has been completed. 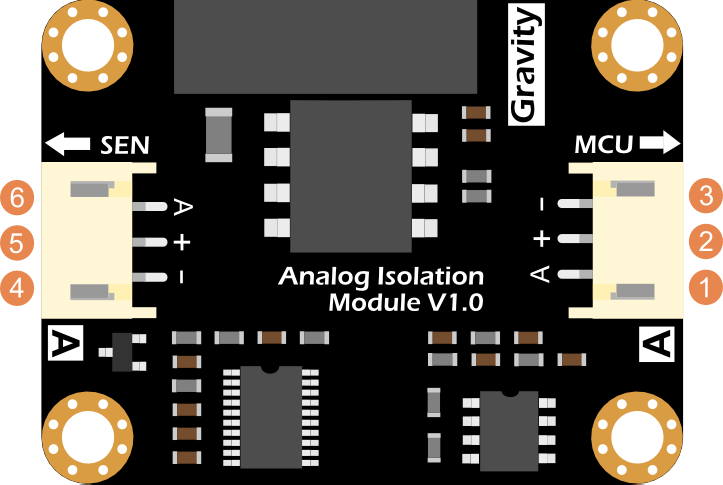 Get Gravity: Analog Signal Isolator from DFRobot Store or DFRobot Distributor.